This Clos is right in the historical heart of the city of Barr. Felix Marco has established his residence in 1762 and has obtained the right to cultivate the vineyards first planted in the 14th century. 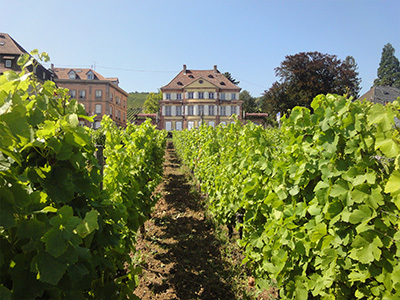 Now our family has the monopole to cultivate this unique place in Alsace. This Clos is protected against the northern wind and has always an early awake in spring. Vineyards are two weeks earlier than in another place. We produce two varieties resulting in two lovely dry white wines : the Riesling and the Sylvaner Clos de la Folie Marco.